Here’s the thing about spaghetti with tomato sauce…if you keep adding a bunch of ingredients into the tomato sauce you are mistakingly doing it all wrong. I’ve purchased my share of jarred spaghetti sauce, like Classico brand, and used to think that Spaghetti sauce was just something with seasoning and bunch of dried herbs. Boy was I wrong. 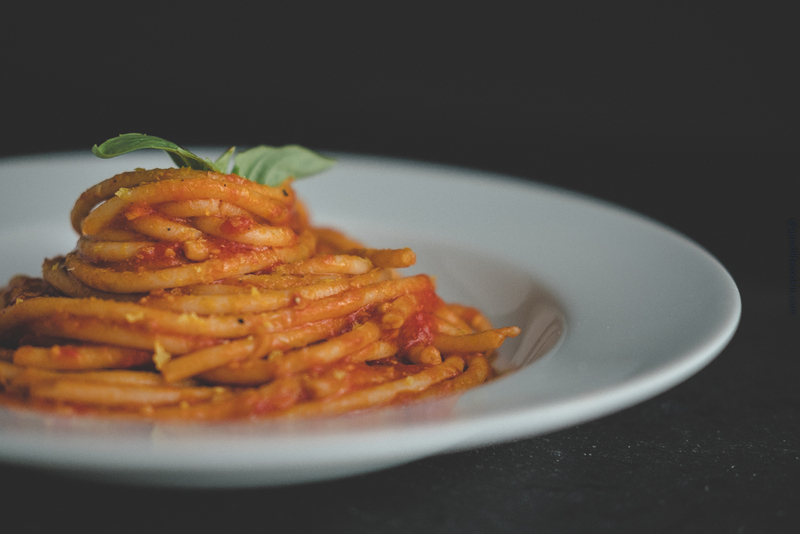 It wasn’t until I turned Vegan where I knew I had to figure out how to make a tomato spaghetti sauce absolutely stunning, while keeping the tomato sauce as pure as possible, resembling what I believe to be, the most authentic form of this dish. For this, we’ll turn to canned San Marzano tomatoes. We won’t be adding too much to this sauce at all. We’ll just need a little bit of red onion, minced garlic, and fresh basil leaves. The key to making a great tomato sauce is to bring out the sweetness by simmering it in a generous amount of olive oil. What you’ll be left with, is a great finishing sauce that will coat the pasta perfectly. So, we’ll fry up the red onions and garlic over low heat, using about 1/4 cup of olive oil. When the aromas start to come out, you can add in the chili flakes, and a sprinkle of salt. Then, we’ll dump in the canned tomatoes, along with 1.5 cups of water and the basil leaves, to bring to a rolling boil. Once the sauce has been boiling for 5 minutes, you’ll be able to press down on the tomatoes, to break them apart, giving all of them a good mash. I like to use the edge of my pot while pressing the tomatoes up against the sides to mash them. There’s beauty and reward in popping tomatoes like this, I promise! To simmer, we’ll be doing a half opened lid on the pot, to allow the tomato sauce to reduce down about 50%, which should be 45 minutes from here so set your timer and embrace the glorious aromas filling up your kitchen right now. Stir every 15 minutes to insure that the tomato sauce doesn’t stick to the pot. For the final product, what you’ll want to check for is a sauce that’s thick, but still has liquidity to it. Give it a taste here too, as you may need to add a generous pinch of salt to your taste, along with some cracked pepper. Cover the pot completely and keep on low heat while you boil some spaghetti pasta. I used bucatini pasta, which I always get in the bulk section at Rainbow Grocery here in San Francisco. The pasta will only require 6 minutes of boiling time…I know, the package says 12 minutes, but we’ll just half-cook them in the pasta water and drop them directly into the sauce, covering the pot, to finish them off for another 12 minutes over low heat. This will allow all the pasta to absorb the sauce and it will help to thicken everything up. As a side note, if you’ve reduced the sauce too much, you can just ladle in some of that pasta water to loosen the sauce up, making sure the pasta is fully submerged. Be sure to stir at the halfway mark (6 minutes) to make sure the sauce does not stick to the bottom of pot, and there remains enough liquid to keep the noodles fluid. For the final count, you’re ready to plate and serve! Just twist up the noodles, and make sure there’s sauce coating every bite! To finish, I love to sprinkle some nutritional yeast over the top, cracked pepper, and a drizzle of basil olive oil! You can even sprinkle some fresh basil over the pasta too. I hope you’ve found this recipe simple and delicious. I’ve personally made this dish over and over so if you’re not able to get the right consistency down on the first try, keep trying until it’s just the way you like it! A great plant based tomato sauce spaghetti using extremely simple ingredients. Dice onion into small bits along with mincing all garlic. Heat pot with 1/4 cup of olive oil over low heat and add in onion and garlic to fry. After 3 minutes, add a pinch of salt and the crushed red pepper flakes. Empty canned tomatoes into pot with 1.5 cups of water and fresh basil. Bring everything to a rolling boil and lower heat to medium, cooking for 5 minutes. Crush tomatoes by pressing a wooden spoon against the edge of pot. Once all tomatoes are crushed, reduce heat to low-medium and simmer in pot with halfway-covered lid for 45 minutes. Stir every 10-15 minutes making sure that sauce does not stick to the bottom of pot. Boil pasta for 6 minutes in salted pasta water. After 6 minutes, take pasta and drop directly into the pot with sauce. If sauce is too thick, add 1/4 cup of pasta water to loosen it up. Cover pot and let noodles sit over low heat for 6 minutes. Stir pasta once and cover pot, letting pasta finish for another 6 minutes. Plate and serve by sprinkling nutritional yeast over pasta, cracked pepper, and a drizzle of basil olive oil. Enjoy!